What’s your biggest parenting problem? 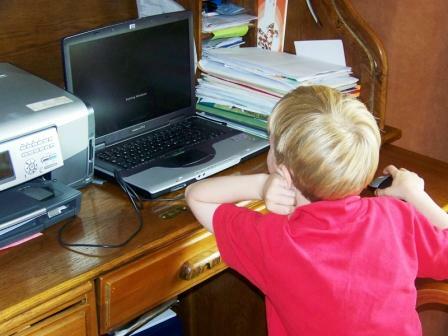 Do your kids spend too much time online and using electronics? Do you often argue with your kids about how often they are hooked up to computer and video games? What’s going on in your families today? I’m interested in your most difficult problem as a parent right now that you wish you could solve by waving a magic wand. Include the ages of your children with the comment. You can share the hardest problems you’ve faced in the past year, the past five years and/or since your child was born. LIMIT of three big problems per comment. Be general and concise when describing the problem. “Discipline” is too general. “Not listening” would be more specific. Here are examples gleaned from my own parenting challenges. Power struggle between me and my daughter, until she left home. Sibling rivalry — kids fighting, all ages. Telling the truth, lying and trust issues, teens. Excessive screen time — computers, cell phones, gaming, television. I realize that parenting problems are a moving target. Give a snapshot of Vancouver MLS where you are now, and/or a really big problem you faced since you had your kids. I’m looking forward to your responses. From Judy Arnal, a fellow parenting educator from Calgary, Canada. Ideally, see the movie before your child does! However, if attending a midnight movie is not on your fun list, at least be present for processing this weekend! Talk to your child about the movie – what did she like, dislike? Ask your child to draw pictures of what she thought of the movie. Give her plain paper, markers and don’t judge. Accept all responses. Temperament matters more than age. If your child is sensitive and empathiseswith other children, re-consider if this movie is appropriate. Realize that reading the books is different from watching the images. Reading allows a child’s imagination to interpret the scenes according to their experiences. Watching a movie forces a child to accept an adult’s interpretation of the scenes which can be much more intense and frightening. Gauge your child’s ability to handle complex subject matter. The onset of puberty allows children the ability to handle abstract thinking and examine the grey areas of right and wrong. Pre-teens are not able to think critically yet, and see things in absolutes or black and white. This is the reason for the PG14 rating. Talking about “The Hunger Games” and getting them to write and draw about it will reduce the impact of those powerful images. Read the book, too. The book is always better than the movie. It’s one of those books that tweens, teens and parents can read together and talk about. 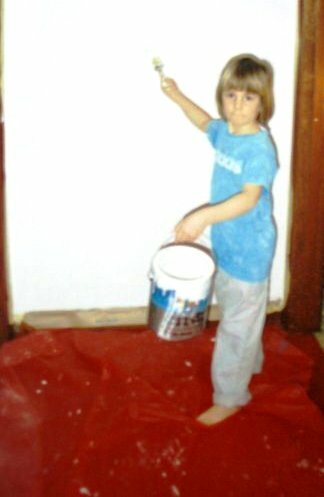 My daughter Kristen, then about age 6, is painting the basement playroom. Kristen did not get cash for doing this. 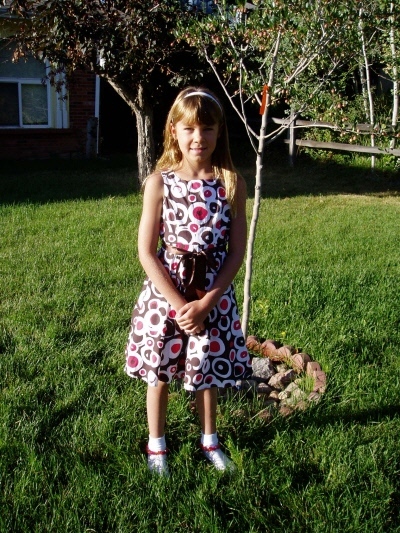 Her rewards were much more valuable: being connected to our family (the BEST substance abuse prevention) teamwork, learning a work ethic, developing a skill, nurturing self-esteem, self-discipline and competence. Today, Kristen is earning a Masters in Fine Arts in sculpture. Money. Can’t live without it. Seems like there’s never enough. Many a marriage has failed over money. The challenge is how to teach children the golden rule: spend less than you earn. You can convey this to children so they grow up to have successful relationships with money, and their life partners. 3. Teach them that work ought only be done for money. Research shows that money is the LOWEST motivation to do anything. Parents must be creative, have a plan and work together to make teamwork fun to motivate kids without money, fear or punishment. This takes time. Pay, praise and reward and punishment are quick and dirty. Creating an environment where contributions are encouraged and appreciated takes time and patience — like most aspects of good parenting. Make a list of everything parents do around the house. Ask every child, tween and teen to make a list of what s/he does. Self-chores do not count, such as, “make my bed, clear my dish, put my toys away.” We’re looking for contributions for the common good: emptying the wastebaskets, setting the table, making the salad or dessert for dinner, mowing the lawn, painting a room. Notice how those chores increased in complexity, as they do as a child gets older. Ask them what responsibilities they’d like to take on. Write them down. Expect them to do the job in the coming week, month and year. Encourage and appreciate their efforts. Hold them to their agreements by being kind, firm and consistent. This is how they develop the precious gift of self-discipline — doing something we don’t feel like doing at that moment. Do not pay them by the chore. Do not withhold allowance if they don’t do them. DO give them an allowance that is NOT tied to money. They contribute to the common good, they enjoy the rewards of being in a family. Don’t you have bad days/weeks at work where your performance was lacking? Here’s a true story about how to handle requests for payment of chores. Noah (age 8): Mom, will you pay me for emptying the dishwasher? Me: (Pause. Thinking quickly.) Sure, Noah. I’ll pay you $3 for emptying the dishwasher. Me: But dinner is $5. Next post: How to use allowances to teach children how to manage their money. Ah, the polish of the first day of school. One day in the supermarket, Eric’s mother asked me, “How’s Noah’s diorama coming?” My truthful answer was, “I have no idea.” Noah and Eric were in fifth grade. Noah’s diorama was his homework, not mine. By third grade, most typical kids can handle their own homework. The more parents can step back and allow children to take responsibility and experience success AND failure, the more children learn about time management. I’m the ultimate free-range parent and could have probably been a tad bit more involved. But I can’t argue with success. My “kids,” now 23 to 30 years old, can manage jobs, school, time and money. They live independently and call home, but rarely for money. We have a good adult-to-adult relationship. It started at home, with family meetings, family dinner, family chores and encouragement. Doing a few simple regular chores at home gives kids an introduction to self-discipline — which is doing things whether we feel like it or not. Kids will never complete chores and homework up to our high standards. Do you anyone who has lived up to his/her full potential? Our job is to encourage children, tweens and teens to take baby steps towards taking on the responsibility for their lives — including homework. Use a family meeting to talk about homework and the morning routine. Set out the expectation that typical kids age 9 and up can manage their school responsibilities with your help as needed. Give every school-age student their own alarm clock [or two if more noise is needed] so they can rouse themselves in the morning. Here’s the kicker. Allow them to fail. Yes. I repeat, allow failure. Think about how many times you have learned from success, and how much failure it took to get to that success. You had to develop the courage [the root of encouragement] to try again until you succeeded. Schools have systems in place to deal with students who don’t complete homework. Allowing children, tweens and teens to experience the consequences at school of failing to do homework. Small stumbles at school. even failing a high school course, will never show up on their resume. Yet failure teaches children how to take responsibility and do what they’re supposed to do without nagging, begging, bribery, threats or punishment, which will make them a star on the job. Letting them handle schoolwork will build mutual respect and enhance the parent-child connection because you trust and encourage them, eliminate nagging, and only interfere when they show they need help. Look dad, here’s my piecrust! Summer can be an ideal time for kids to do chores regularly without the interruption of school and other activities. Kristen is spending the summer as an intern at Franconia Sculpture Park north of Minneapolis, Minn. In addition to helping resident sculptors and doing her own sculptures, Kristen takes turns cooking dinner for 13 to 15 people. I smiled and remembered how I taught Kristen to cook. “Yes. I need your help.” I still hate to cook alone. These strawberry rhubarb pies were really delicious. Five minutes later she wandered down reluctantly. This is how Kristen learned to cook — reluctantly. It’s an example of how tweens and teens can resist being included in family time, but they still show up. They like to be invited, to be wanted and included, BUT they can’t show too much enthusiasm because of their age and hormones. What are your kids doing this summer now that they might have some extra time? 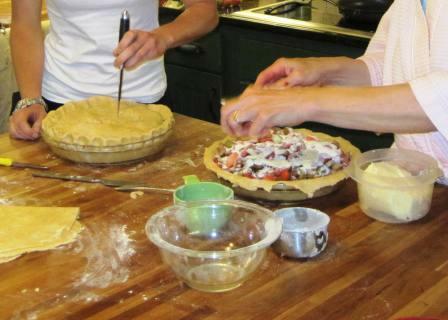 If they want to stretch and learn new skills, like making pie crust, appreciate and encourage their efforts. Have patience and hope. You’re planting seeds that will blossom in ways you can’t imagine now. Difficult children eventually grow up and become interesting. I have many “Ian” stories because he was so challenging. He was the third child born in 3.5 years, and has a younger sister. 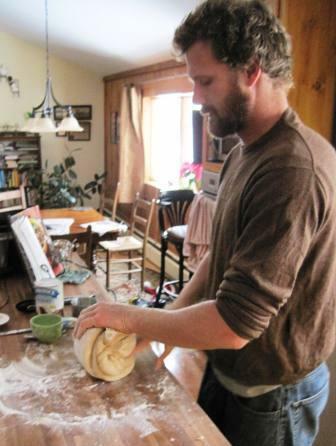 Ian is making pizza dough here. 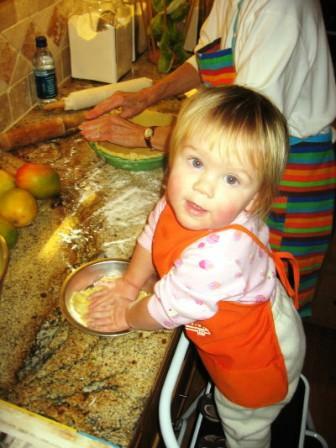 Making pizza together on Friday nights and watching a movie together was one of our family traditions. I can still see Ian, above, then 17 years old, standing in the kitchen, looking down at me from his 6’2″ height, arguing in a tortured voice. Ian: “It’s stupid.” Shakes hands and shoulders. Sighs. Me: “It will only take 20 minutes. Then you can go out with your friends.” Some things are non-negotiable. Every fiber of my being sent the message that I was not going to budge from this expectation. Ian: “I don’t see why I must have family dinner.” I give him the last word. No worries. He came to family dinner and got a dose of connection, values and love. Research shows that regular family dinner (breakfast works, too) three or more times a week results in lower use of drugs, alcohol and cigarettes among teens and tweens. Family dinner interrupts the time between 2 pm school dismissal and midnight, when junior operators must be off the road. So it limits the distance and trouble they can get into. The worst trouble one of our teens ever got into was when that teen should have been home for family dinner. Bob and I had become permissive. We immediately got back on the family dinner track. Our family made pizza together on many Friday nights and watched a G or PG-rated movie together. Everyone put toppings of their choice on a small pizza. By middle school, they could make and roll out the dough so it was a team effort. We all pitched in to clean up. My “kids” request pizza when they come home to visit and we share an enjoyable family dinner. Get some pizza pans. Connect to your kids. Look how fast they’ve grown already. They will leave home — and this will make you happy. Family dinner reduces the likelihood they will stray towards drugs, alcohol and cigarettes. This will make you happier. 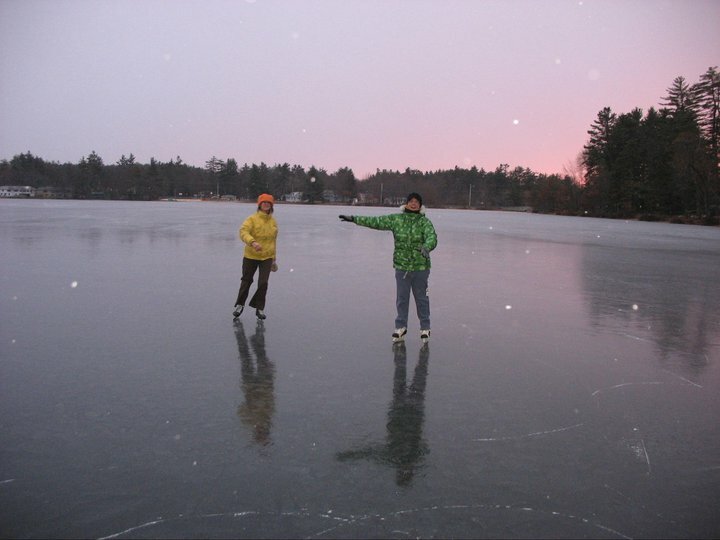 Teach kids NOT to skate on thin ice! On Saturday a scout leader at the Polar Bear Derby (rescheduled from January) told me that he had repeatedly warned his son and the other kids to stay away from the half-melted pond. Alas, his child got wet. “I had to take him home for dry clothes and bring him back,” the scout leader said, shaking his head with disappointment. How wonderful to know Dad will bail out Junior no matter what. Kids who never experience the related outcome of their decisions do not learn to take responsibility for their actions. Dad will bail him out and he still gets to participate , despite his poor choice. He can continue to make bad decisions because good ol’ Dad will bail him out. I’m interested in the big picture and what precedent Dad set. Tough Love is a group of parents of young adults who have realized they constantly enable their child to make bad decisions. The parents must learn to say No, I won’t bail you out again from the poor choices you made, which often involve substance abuse and addiction. It’s hard for parents to say “NO” or to deny Junior the Polar Bear Derby. Dad could have let Junior experience being wet and cold. Junior could have asked to be taken home or gone inside the lodge to warm up. Ideally, Dad could teach Junior to listen at home, BEFORE the Polar Bear Derby. It takes time, patience and consistency to teach children to listen and make good decisions. Investing the time, patience and consistency in making small decisions may someday save your child’s life. The goal is for children to become teens who will make good decisions when they become teenagers and they’re 60 miles away, going 60 miles an hour. Be driving the speed limit? Be with friends you know and like? Sober and focused on driving? Have told you the truth about where they are and what they’re doing? Made good choices around sexuality? Start now to teach good decision-making by giving children enough rope to burn but not enough to hang. Let them experience small repercussions, like being cold and wet during the Polar Bear Derby, forgetting homework or mittens, not being able to find their sporting equipment because they didn’t put it away. It will pay off in the long run.